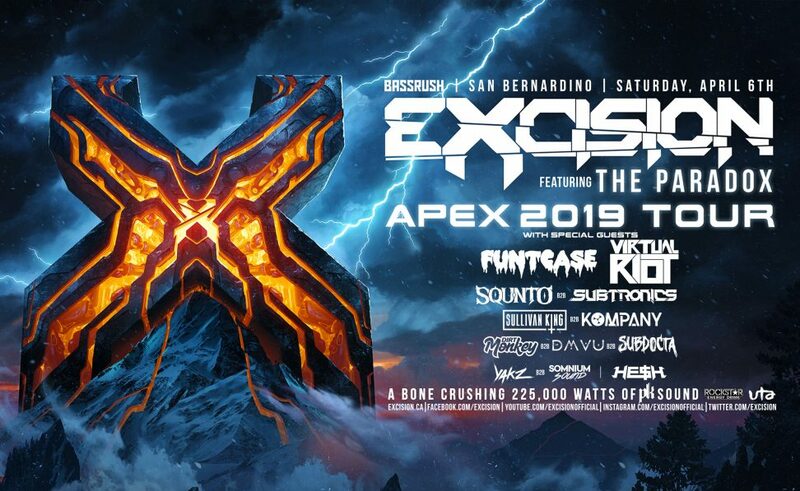 Jeff Abel, better known by his stage name, Excision, is expected to make a BIG mark on April 6 at the Nos Events Center in Southern California. The world-renowned bass DJ & producer is bringing 225,000 watts of bone-crushing PK Sound, and is hyped to be accompanied by a numerous amount of acclaimed supporting acts. The show features Excision’s extravagant stage performance known as “The Paradox”, and takes part along his APEX 2019 Tour. Accompanying the notorious bass producer’s wall rattling show is an arsenal of extremely gritty producers in the game. Producers such as Funtcase, Virtual Riot, Squinto B2B Subtronics, Sullivan King B2B Kompany, Yakz B2B Somnium Sound, Dirt Monkey B2B DMVU B2B SubDocta, and Hesh will be coming at bass fanatics with an arsenal of unreleased music, mashups and more! Based on the artist line up and the various praised reviews over “The Paradox” this event is not suitable for the feint hearted and attendees can expect the occasional mosh pit. Tier 3 tickets are currently priced at $70 and are expected to sell out relatively soon, so attendees who wish to experience this one of a kind dubstep – riddim extravaganza should act now!